I didn't get to finish my special projects that I was working on so I'll be attempting to do that today and hopefully post the pic soon! My card is featuring another sketch from 2 Sketches 4 You and I think it totally rocks!! Aside from having to choose which colors, it came together soo easy...gotta love it when that happens!!! I need to start fixing dinner, do laundry and work on my projects.....geez; I'd rather just stamp all day LOL!! Thank you so much for stopping by! Have a great rest of the day and try to stay warm!!! You are right about the colours, they are great! The ribbon is just gorgeous and I do like that sentiment! Beautiful! I love the colors you chose and the pearl accents! Great take on Laura's sketch! 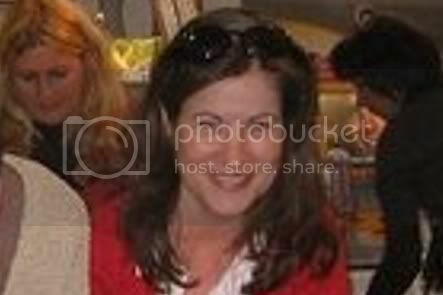 This is gorgeous Jackie!! WOW! I love how you used the challenge colors! Wow, Jackie this is awesome!! I love that stamp and I don't have it .....YET!!! Your card is soooo beautiful! I love every detail. I just ordered that stamp set...can't wait to play with it. so love the colors, great work! WOW ... nicely done Jackie!! Love your choice of colors/papers!! Awesome!! Another great Jackie creation! Love it! This is beautiful! I love the sketch you used and the colors and extras are awesome. Great work! 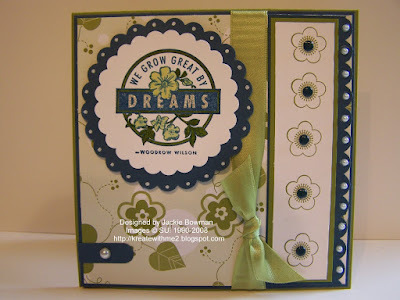 This is one gorgeous design, Jackie...love the stamps you used and the colors are sooo pretty!!! Wouldn't it be nice if Santa would bring us an elf to do the cooking and cleaning so we could stamp all day...I am making my list right now!! Love those colors and that is a fabulous sketch. I'm seriously going to have to do more sketches. This card is way gorgeous!! Love it when it all just falls into place :D I love your cherry blossoms! Great colors! Those colors do look fantastic together! I love them, love the card! Just WOW! TFS! Fabulous take on the 2s4y sketch, I love the colors you used! Gorgeous card Jackie, love the colours and the detail! Gorgeous!! great the colors, Love it!!! I am totally amazed by the beauty of this card... every single detail is just perfect... I love it, and not only this one, but all your other designs. I am adding your blog to my YUMMY! blog list. Gorgeous card, lovely colours too.